If you wanted to create a dynamic Excel chart of last 3 months of your data but didn’t know how to use or didn’t want to use the Excel Offset Function, then check out this alternate technique. Maybe it is because you don’t want to use Excel Volatile functions or just don’t get how the Offset function works. Please note that this technique will require you to press a button but that isn’t too difficult. The basic’s of this technique is to build a table of chart values with corresponding formulas that identify the last 3 months. Then create a Pivot table and resulting Pivot chart out of the data table with a filter on the last 3 months that were identified. This formula checks to see if there is a values in the sales column. 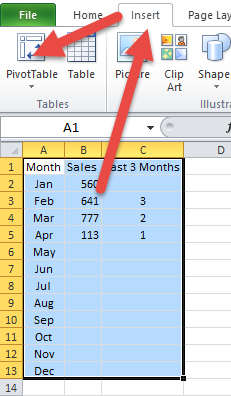 IF Sales Column cell adjacent to the current cell is greater than zero and the Sales Column cell one row down to the current cell is blank, then this is the last entry of the current year. So we put a “1” as the result. IF that is not the case, then we check to see if the value 1 row down from the current cell in the Last 3 Months Column equals a 1 then this cell is the 2nd most recent and we put a 2 in the cell. Finally, if that is not the case, then we check to see if the value 1 row down from the current cell in the Last 3 Months Column equals a 2 then this cell is the 3rd most recent and we put a 3 in the cell or else we leave it as blank. Your data set is not completed for this tip/trick. But to only show the data for the last 3 months, we need to filter out all the blanks in the “Last 3 Months” column. You can do that in one of 2 ways. 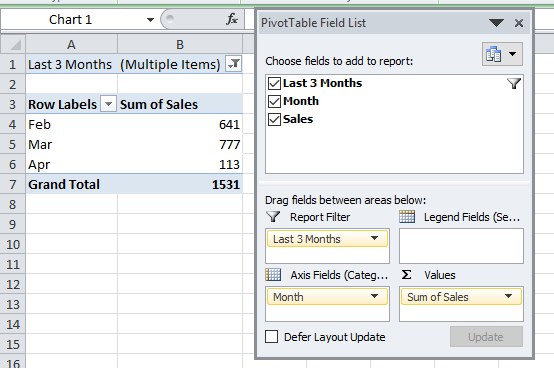 Either add a filter to your columns in the original data set or to create an Excel pivot table. I choose the pivot table route as it does not hide your rows so that you don’t have to unhide them next month to add your next data point. 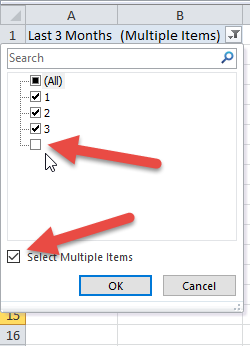 Then change the Report Filter of “Last 3 Months” and de-select the Blanks. 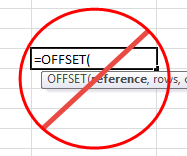 Your resulting pivot table will look like the image you see above titled: “Pivot Table Field List Non-Offset Tip”. 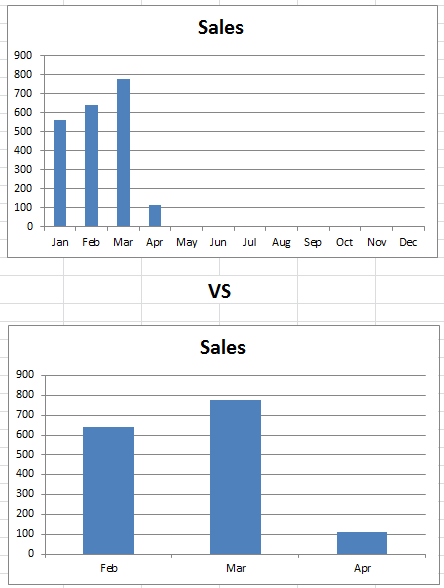 Now that your pivot table is completed, all you need to do is create a pivot chart. To do that, simply click anywhere in your pivot table and then go to the Insert Ribbon and choose any chart that you want to create. Here is what your final chart will look like. You may want to clean up the chart by Hiding All Field Buttons on the chart (right click to do that). 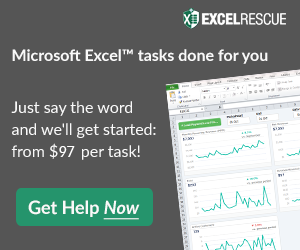 So if you need to create a non-volatile ‘mostly dynamic’ chart, you can use a simple IF formula along with a Pivot Table or Worksheet Filter to help you chart the most recent data points and save you time adjusting your Excel Charts. I would have written like this to avoid nestling the IF-statements. And if the boss suddenly wants to see 4 months you just edit C3<3 into C3<4 instead of adding another IF-statement. Something went wrong with the first post, please delete it if possible. Something is REALLY weird. The formula is changed after I post it. I will try spreading it over several rows and see if that solves it. Thanks for the formula. Not sure why the system converts the formulas.